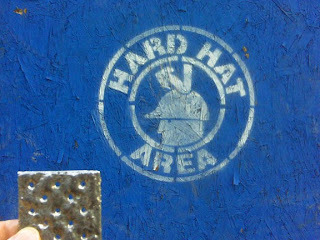 Eye catching graphic in the neighborhood that used humor to remind the workers why they need their hard hat. Hopefully, there isn't that much debris raining down. The graphic for head-runs-into-object would have been harder to illustrate, but is equally as common as object-falls-on-head (i.e. user error).